A blue satin petticoat, finished at the bottom by a silver foil trimming, above which is a mingled wreath of white and pale blush roses; this is surmounted by a rich trimming of silver lama. Over the blue satin petticoat is one of point lace, short enough to display the entire of the rich trimming of the satin petticoat; the border of the lace one is extremely beautiful; the pattern of the middle is a rose, thistle, and shamroc entwined. The corsage is white satin, and the front, which is formed in the stomacher style, is nearly covered with pearls. The corsage is cut very low round the bust, and the front part is edged with pearls; we believe there are three rows. 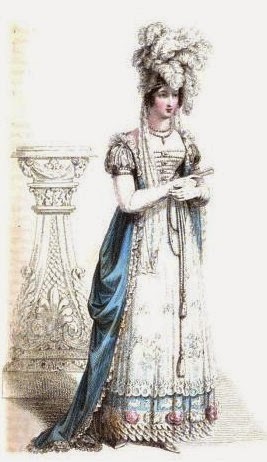 The robe is blue zephyrine; the body rather long in the waist; the back part made in the corset style, and with a small peak: the robe is trimmed round with Urling's point lace, set on very full; a double fall of point lace ornaments the top of the back; it forms a full ruff between the shoulders. The sleeve is white satin, covered with blond lace, and tastefully intermixed with pearls; it is very full on the shoulder, but the fulness is confined at the bottom by a plain broad band of pearls. The front hair is disposed in a few light ringlets on the forehead; the hind hair is concealed by a profusion of ostrich feathers, which are placed behind, and droop over the forehead, which is encircled by a broad pearl bandeau. Point lace lappets, white kid gloves, and white satin shoes, ornamented with rosettes of pearl. Necklace and ear-rings, pearl. White crape fan, richly embroidered in silver. We are indebted to Miss Pierpoint, inventress of the corset a la Grecque, of No. 9, Henrietta-street, Covent-Garden [for this dress]. What do you think of this dress? Would you have worn it?